A straightforward clich that feels out of place in the new wave of cRPGs. What is it? A cRPG in the D&D universe. cRPGs excel in their incidental details. Pausable, often turn-based and tooltip-heavy, they all allow you time to drink in your surroundings, describing in text what third or first-person games struggle to show. A bland stone texture might become ‘a mossy slab, worn by the passing of lonely centuries’, or perhaps ‘a toothy monolith casting a chill black shadow’, or, in Sword Coast Legends’ case, just another piece of repeating hallway. Sword Coast Legends is a cRPG set in the world of Dungeons & Dragons—the grandad of the RPG—so if any game can capture the essence of pen-and-paper roleplaying it ought to be this one. Sadly, Legends is out-innovated by almost every RPG since the Kickstarting frenzy began. It’s solid enough, sure, but my head met the table with a thunk as the opening quests were unveiled: gather mushrooms, collect lost goods, find two missing persons. Later the game throws in some more interesting variations, like killing off boss-level monsters, rescuing captives and performing occult rituals, but the formulaic introduction is agonising, dragging on for several linear hours of goblin-infested caves and ooze-riddled sewers. Sword Coast Legends favours quantity over quality. Points of interest are separated by gulfs of filler—there’s always five packs of goblins too many, one more copy-pasted mausoleum to be explored or some artificial MacGuffin to gather before you’re rationed another chunk of story. And Legends is horribly aware of this shortcoming: at one point, you’re given the dialogue option, “Let me guess: She’s holed up in one of three locations, and we have to figure out which one.” It’s a running joke with no punch line, because no matter how often Legends acknowledges its aged quest structure, it doesn’t let up. I was prepared to give it some licence to recycle fantasy clichés—if Dungeons & Dragons didn’t invent them, it’s certainly responsible for mashing them together into game format. In many ways, however, Sword Coast Legends is a step back from its pen-and-paper inspirations. A good dungeon master is able to react to any action you can think up so long as it’s within the rules, while a dungeon is not only a gauntlet but a puzzle to be solved. Though Legends opens up in its second act (the Bioware-brand companion loyalty quests are a highlight), whatever quest you pursue gives you no leeway to improvise. 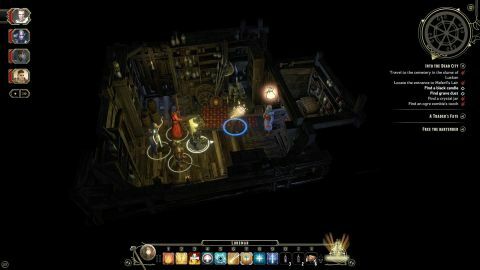 Contrast this with Divinity: Original Sin, a game which gives you a high-level objective and just leaves you to it, allowing you to smash through doors, break chests and interact with everything to solve the riddle. Two years ago, Sword Coast Legends would have been part of the vanguard for the resurgent cRPG, but we’re past that now. This is once more a competitive genre that demands new ideas. It's pretty enough. It renders the fields, forests, cities and sewers of its source material with flair, rejecting the simpler style of Original Sin or the hand-drawn backdrops of Pillars of Eternity in favour of a realistic approach. Insofar as D&D can be realistic, of course. The DM is limited to the same quest structures as the campaign, making it hard to craft anything personal. Drop-in, drop-out co-op works without a hitch, too, which was a concern when Legends’ release date was first pushed back, although given how combat works, I can’t recommend playing with strangers on anything but easy. Though stats adhere to the D&D rulebook, it’s not strictly turn-based: the party wades in as one, with a global cooldown between each character’s swings or spells, and anyone you’re not currently controlling takes care of themselves with pre-set tactics. The active pause is disabled by default in co-op, which makes manipulating more than one character at once, and thus strategizing, nigh impossible. AI-controlled party members could do worse, although their tendency to burn big cooldowns to heal a scratch or put a single foe to sleep can scupper grand plans. The Dungeon Master mode displays a similar lack of ambition. It allows you to do what the game does, constructing a complex cave network or temple to stuff with monsters and traps and either play against adventurers live or let them quest by themselves. But even this is a poor imitation of pen and paper. The dungeon master is limited to the same quest structures as the campaign, making it hard to craft anything truly personal. There’s the odd technical hiccup, like the invite button in Dungeon Master mode that doesn’t do anything, faint input delay and stuttering without good reason. Nevertheless, it functions for the duration, reliably and all too predictably. The last thing a game of Dungeons & Dragons should be is unadventurous.